Even though it’s already mid Spring, sometimes it still feels like we haven’t yet left winter. The Melbourne weather is as unpredictable and unforgiving as ever and I felt the full force of it about a week ago in Tasmania where it rained like the world was about to end but we still had to stick to sightseeing plans. That was not a fun experience. Wet, cold, dirty and a lot of walking does not go down well in my books. My wardrobe is as confused as I am. When I thought it was getting warm with consecutive mid 20C weather and I finally take out all the summer gear, the temperature suddenly drops to mid 10s. The only good thing to come out of this is that I can still enjoy my wintery dishes that little bit longer. I’m very much a summer animal where I prefer to hibernate when it’s cold. When it’s cold, I also tend to crave for stews or hot noodles with lots of meat. Yuye made this beautiful dish just before I went on my epic trip around Australia and as it’s quite cold right now, my craving metre has gone through the roof. However, I no longer have pork belly in the fridge! I hope some of you might, or be willing to go out and get some as this dish was so delicious I had it again the very next day and again a few days later. This dish is kind of like a fusion between Japanese and Chinese food. 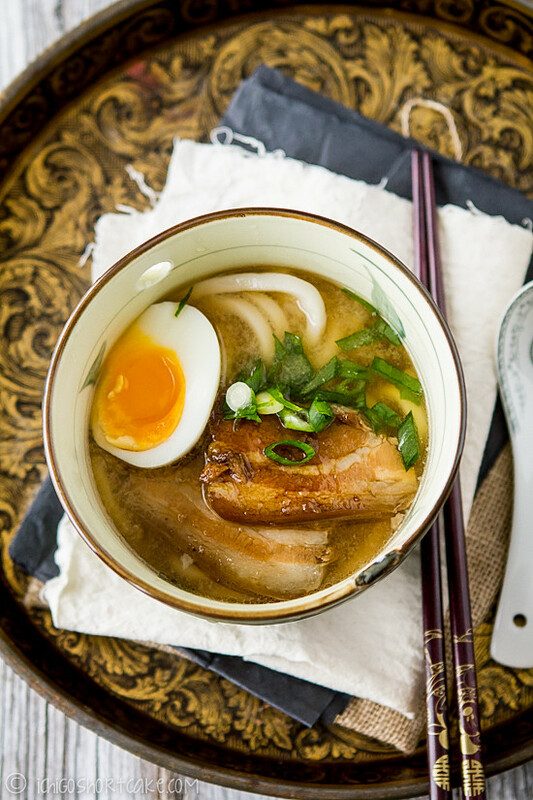 The pork is marinated in Chinese spices whereas the soup has classic Japanese flavours. If you like your soup a bit more Chinese, feel free to add some of the marinating sauce and a bit less miso paste. I had it both ways and both were just as lovely. Also the pork was boiled and completely cooked through beforehand so the step for boiling the pork can be done a day or even days before it’s required. Just remember to keep it refrigerated or even frozen until you make the noodles. I realised I had left out the eggs in the ingredients photos. Oops. 1. Heat a small to medium pot with water until boiling. Boil the pork belly for roughly 10 minutes then change the water and remove all the scum. Boil for a further 30 minutes, remove from water and pat dry with a paper towel. 2. Cut pork belly into slightly less than 1cm thick slices. 3. Place all marinade ingredients including the garlic into a small pot. Simmer until sugar is dissolved (roughly 5 minutes). Stirring occasionally. 4. Add pork belly, coating the surfaces evenly and simmer until most of the liquid has disappeared. Turn the pork over every 2-3 minutes for an even cook. This takes roughly 15-20 minutes. 5. Strain the remaining liquid, discarding star anise and garlic and set aside with the pork. 1. Boil a small pot of water. Place eggs in gently and boil for 6 minutes. Prepare an iced water bath in the mean time. 2. As soon as the eggs are done, quickly but gently place the eggs in the iced water. Keep it there for roughly 10 minutes and testing the surface to make sure it’s completely cooled and feels chilled. 3. Carefully peel the shell off and cut eggs into halves. 2. Heat dashi stock, soy sauce, mirin and remaining pork marinade in a medium pot until boiling, then remove from heat. 3. Mix miso paste with some of the soup in a small bowl to dissolve it, making sure there are no large lumps. Add miso back into the pot and stir through. 4. 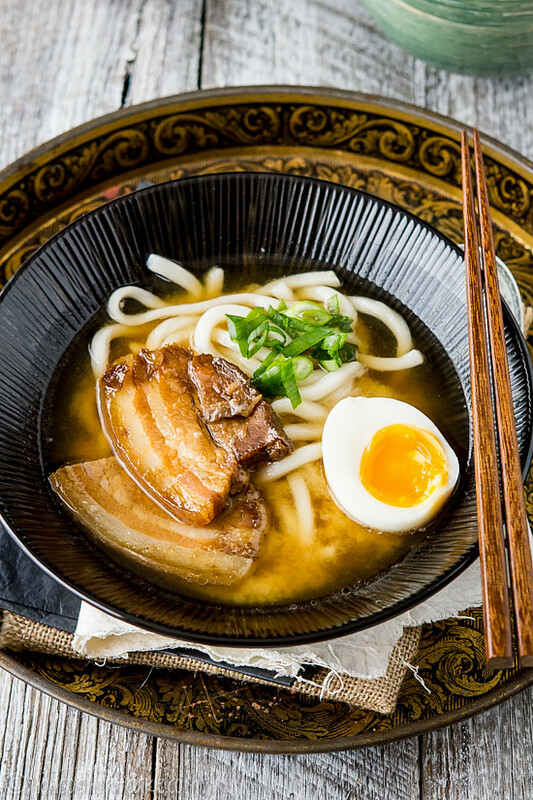 Place udon in a bowl, pour on hot soup and add eggs. Top with chopped spring onions to serve. * After udon is cooked, make sure to drain and rinse well for a smooth final texture. Question time:Is the weather hectic where you live or is your weather goddess not as temperamental? Oh wow, this looks amazeballs! A magnificent dish and scrumptious combination! That egg is so perfectly cooked. This looks so delicious! Isn’t this weather crazy! I’m just glad I hadn’t put my umbrella and coat away yet….come on summer, come on! Or at least spring would be nice! if yuye can enter the master chef, maybe that will be the first step he become a real chef. You are killing me with these photos, and pretty much guaranteeing that I have to make it soon. Oh mistake to come right before lunch time! >_< Major major drool going on..and my stomach reacted as well. Looks SUPER good!!! I made Japanese stewed pork (kakuni) last week but no leftover. 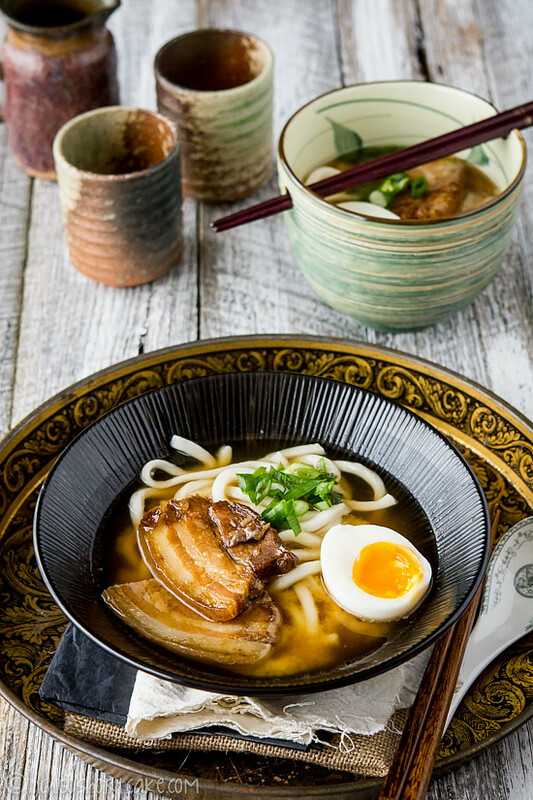 Otherwise I'd totally consider making this quick udon dish. I am way too hungry to make this for lunch. I need to plan ahead and cook this Jenny! SOOO delicious looking… hungry…. Pork belly is very flavorful, so I’m sure this was delicious! I have made some lentil and rice for dinner but really I wish I had this tonight. I am craving it. Looks absolutely fabulous! what an incredible combination and it looks absolutely amazing! great recipe. I made udon all the time. But my broth is only dashi and soy sauce. 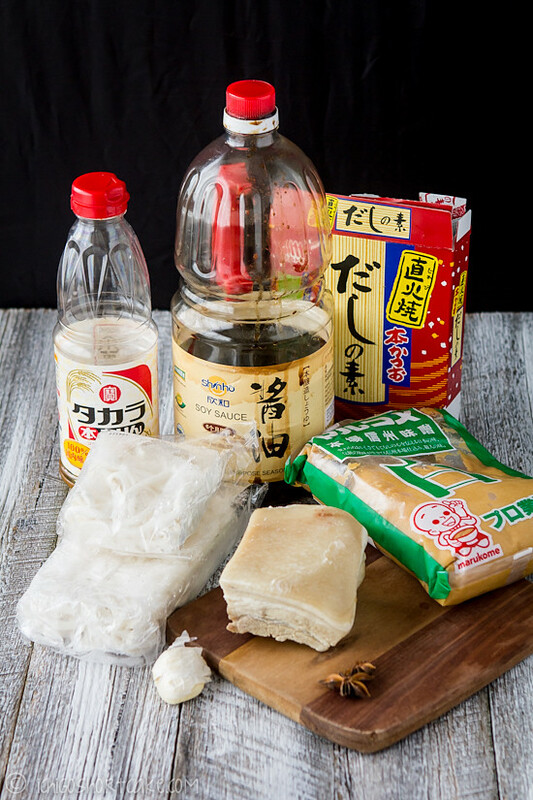 I love your version of mirin and white miso. I will definitely try that. And who doesn’t love pork belly? Your recipe is so easy and simple. Sounds great! Thank you. I made these recipe two times. Love the broth flavors. Absolutely delicious! But I don’t know why the pork belly was on the tough side. The first time, I followed your recipe exactly, but I thought the pork can be braised for longer. The second time, I cooked the pork for 1 1/2 hour, but I still thought it was too tough. Any tips? Yum. I’m going to make this for dinner tonight. I will let you know how it turns out!